D’Custom Freak VIP Style - Japanese Style Bee Dragon Majseta! - Muscle Cars Zone! D’Custom Freak VIP Style – Japanese Style Bee Dragon Majseta! Like it or not, Japanese style is something we cannot leave behind. Therefore, we will take you on a new journey called Bee Dragon. We are going to take you to have a VIP sneak peak and a dive into Imamura-san`s modern, sophisticated and magnificent understanding of the bippu style. The whole concept of Imamura is to allow people to get rid of the usual, common sedans and enjoy in something VIP, something fabulous, something that people would not resist talking about. That something will put you between the limits of legal and illegal. Since these cars show your regal behavior in the society, it is not possible for somebody to reject such offer. That is the case with Toyota Crown Majesta, owned by one of the youngest customers of Imamura and member of the D`Custom Freak. So, this customer gave his S170 to Bee Dragon and it stayed there for quite a lot in order for everything to be assembled and completed. 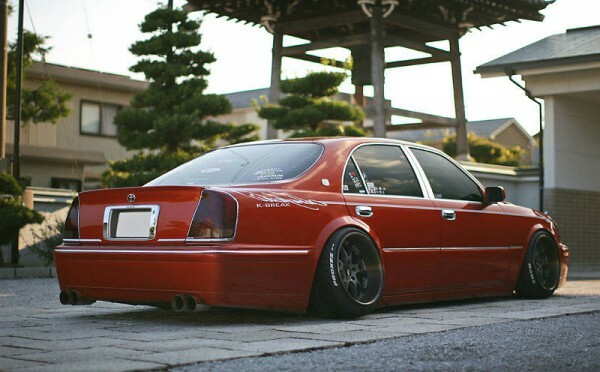 The attitude that the sedan conveys and has as a car is one of the key elements that Imamura pays a lot of attention to. Therefore, the first thing to be fixed was the bumpers. In order for everything to turn out quite well, the bumpers were extended 4cm in width. Before the whole external appearance of the car was thought of, the decision over the wheels had to be made. So, they chose 18x10J at the front and 18×11.5J at the rear. Since having this kind of VIP sedan and driving it is really exciting experience, the company strives to make your ride as comfortable as possible. Therefore, the suspension is reduced to minimum, while the spring rates contain bit granite, 28 kg/mm for the front and 50kg/mm for the rear. The exterior is also made as good as possible and characteristic symbols of Bee Dragon have been included in it. As for the engine, we have to be honest that it hasn`t been paid a lot of attention to. The Majesta features 1UZ V8 engine backed up by K-break exhaust system. When color is concerned, we all know that VIP sedans in Japan used to be black, but now that is changed and the Majesta has metallic orange color. The interior is generally left untouched and it has leather seats in which the driver is comfortably placed. The driver is logically satisfied with the interior and therefore it has not been altered.